He waved, then took off the suit jacket, revealing his black T-shirt, picked up his famous guitar Trigger and tore into “Whiskey River,” which has been the opening number for probably all 200 of his gigs in 2010. 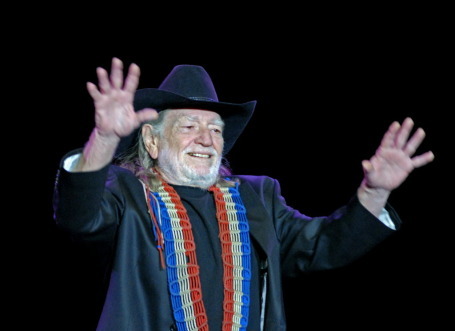 Willie also was wearing a black cowboy hat, which he took off during a piano solo by his sister Bobbie. Then he switched to a bandana. Throughout the night, he’d toss his bandana to the crowd and put on another one or wear a cowboy hat tossed onstage (even if it was a cowgirl hat). He seemed to be in a good mood. He didn’t apologize for twice postponing this two-night stand. Actually, he didn’t talk much between songs, usually starting the next song while the sell-out crowd was still clapping for the previous one. As I said in my review, Willie never explained why his longtime drummer Paul English (subject of “Me and Paul”) played on only one or two songs and his brother Billy English handled the snare drum the rest of the night (apparently Paul had a stroke a while back). Other than his sister Bobbie, Willie did not introduce the other musicians (bassist Bee Spears, harmonica ace Mickey Raphael) by name. Streaming live at the library--it's Jay Z!